Those of us who regularly take vitamins and minerals to support overall health or a specific health challenge know the importance of optimal nutrition. But many may not know the ideal time of day to take specific vitamins, whether to take them on an empty stomach or with food, or what combinations of vitamins to avoid or take together. Timing really is everything, as when you take your supplements can either boost or diminish their effectiveness. According to the Council for Responsible Nutrition’s annual survey of dietary supplements, 71% of women and 65% of men take dietary supplements. By far, the most popular supplements are multivitamins and minerals, with 97% of supplement users relying on these to complement their health. While 90% of supplement users report following label information, this little primer may help those who take multi vitamins and those who take more than one supplement to receive the maximum benefit from their formulas. Probiotics – Probiotics are best taken on an empty stomach, so for that reason morning may be best, although some prefer to take them at bedtime. When the stomach is empty, digestive activity is quiet and stomach acid and pH balance are relatively low, increasing the chances for the helpful microorganisms to thrive. Iron – If you are advised to take iron supplements, take them in the morning, as iron is best absorbed on an empty stomach. Caffeine, dairy and calcium can negatively affect absorption, so it’s best to avoid these for several hours after taking iron. Vitamin C, however, can aid absorption, so by all means wash the iron supplement down with orange juice or lemon water. Multivitamins – Taking multi’s with your first meal is ideal, as the vitamins are absorbed along with the naturally occurring nutrients contained in the food. As multivitamins contain both water and fat soluble vitamins, be sure to include some healthy fats with your meal for optimal absorption. If your multivitamin formula recommends more than one capsule per day, take them in divided doses at breakfast and lunch. B-Complex vitamins – Taking B vitamins with breakfast helps to boost your metabolism and convert your food into energy, which can be used throughout the day. As B vitamins help to fight fatigue and create energy, it’s best to avoid taking them late in the day. Vitamin C – Vitamin C is best taken in the morning to support the immune system and boost energy levels. Vitamin C is a water soluble vitamin that lasts only a few hours in the blood stream, so if your formula recommends more than 1 tablet per day, take it in divided doses with meals to get the full benefit. Vitamin E – This fat soluble antioxidant vitamin is best absorbed when dietary fats are present, so if your breakfast includes some healthy fats, such as yogurt or nut butters, morning is a good time. Otherwise, lunch or dinner time is fine as long as you are having some healthy fats with your meal. Fish oil – Important to support many aspects of health, fish oil is best taken with a main meal to aid absorption. Take omega-3 supplements at breakfast along with your multivitamins or if more than one capsule is recommended, take them in divided doses at breakfast and dinner. CoQ10 – CoQ10 is involved in energy production and can be found in every cell, especially in the heart, which has high energy requirements. CoQ10 is best taken with a meal that contains dietary fats, and avoid taking it late in the day so that it doesn’t disturb your sleep. Iodine – Iodine is not stored in the body, so regular intake is needed. Iodine supports normal cognitive function and healthy skin, and also increases energy levels. Table salt is fortified with iodine, but if you are not a regular salt user or use unadulterated salt, kelp tablets taken with lunch may boost midday energy levels. Vitamin D – Vitamin D is best taken with a meal that contains dietary fats. It’s possible that Vitamin D can negatively affect sleep, so lunch time is a good time to get your Vitamin D.
Vitamin K – Vitamin K is best absorbed along with dietary fats and ideally should be taken along with calcium, vitamin D and vitamin C. Avoid taking vitamin K if you are taking Coumadin or any anticoagulant prescription drug, as Vitamin K can interfere with the effects of the medication. Calcium – Calcium aids nerve transmission and muscle function. To get the full benefit, take calcium in the evening along with magnesium. Magnesium – Magnesium has a calming effect on the muscles and nervous system and may aid restful sleep. Magnesium works synergistically with calcium, so take these together either as individual supplements or in a combined formula. Digestive Enzymes – Digestive enzymes can be taken with any meal or within 30 minutes of your meal. Unless you have serious digestive issues, they don’t necessarily need to be taken with light meals or snacks, but can be very beneficial for optimal breakdown and absorption of nutrients when taken with main meals. Fiber – Fiber supplements may be taken either first thing in the morning or before bed. Be sure to take fiber with a full glass of water and get plenty of water during the day. Always check with your healthcare provider before taking any fiber supplement, as fiber may delay or reduce the absorption of certain medications. Additionally, do not take fiber supplements at the same time as medications. 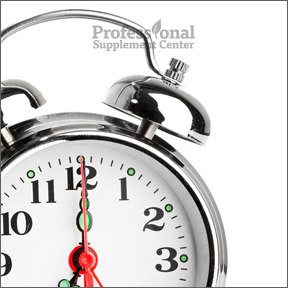 Should you have any questions about the best time to take any supplements, please call or email Professional Supplement Center. If you are taking any medications, check with your healthcare provider or your pharmacist before starting any supplement regime. Best Time to Take Probiotics. Best Time of Day to Take Vitamins. This entry was posted in Home and tagged B-Complex vitamins, Calcium, CoQ10, Digestive Enzymes, Fiber, fish oil, Iodine, Iron, Magnesium, Multivitamins, probiotics, Professional Supplement Center, The Best Time to Take Nutritional Supplements, Vitamin C, Vitamin D, vitamin E., vitamin K, Vitamins and supplements, www.professionalsupplementcenter.com. Bookmark the permalink.